At once reptilian and avian, dinosaurs enable us to imagine a world far beyond the usual boundaries of time, culture and physiology. We have envisioned them in diverse and contradictory ways, reflecting, in part, our changing conceptions of ourselves. 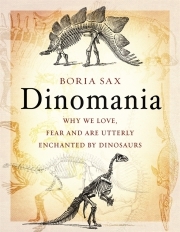 Their discovery, around the start of the nineteenth century, was intimately tied to our awareness of geological time; their vast size and power called to mind railroads, battleships and factories, making dinosaurs, paradoxically, emblems of modernity. At the same time, their world was nature at its most pristine, and they simultaneously symbolized childhood innocence and wonder. Dinosaurs provided a sort of code that has enabled people to speak indirectly about the possibility of our own extinction. Not unlike humans today, dinosaurs seem both powerful – almost godly – and helpless in the face of cosmic forces even mightier than themselves. 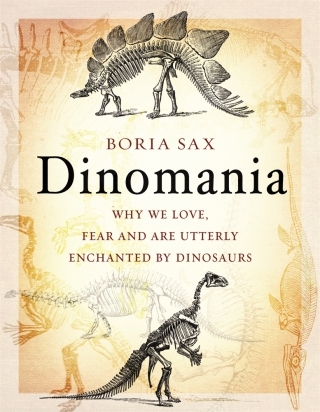 Dinomania tells the story of our romance with the titanic saurians, from early stories that were inspired by their bones to the dinosaur theme parks of today. It concludes that, in our imaginations, dinosaurs are, and always have been, essentially dragons, and their contemporary representation is once again blending with the myth and legend from which it emerged at the start of the modern period. Boria Sax is lecturer in literature in the graduate programme of Mercy College, New York, as well as at Sing Sing and Taconic Prisons. He has published over 15 books which have been translated into many languages. These include Crow (Reaktion, 2003), City of Ravens: The Extraordinary History of London, its Tower and its Famous Ravens (2012), Imaginary Animals (Reaktion, 2013) and Lizard (Reaktion, 2017).